Hey, welcome! I’m so glad you stopped by today! 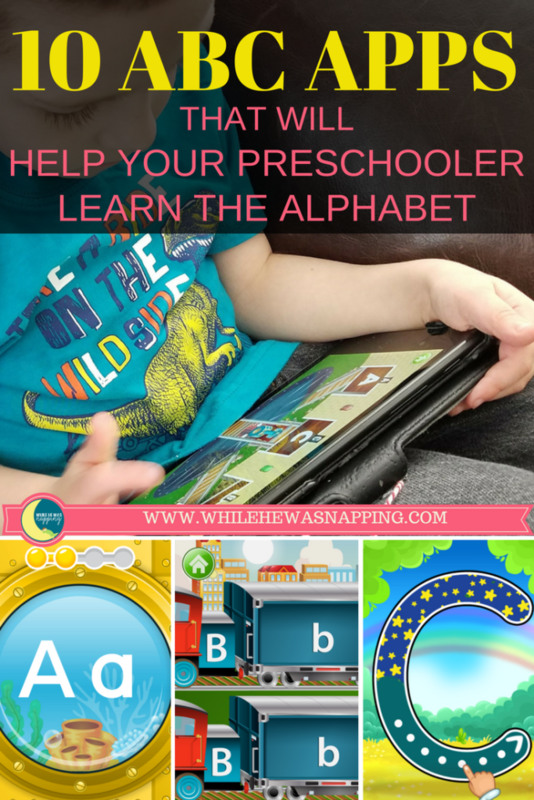 Is your preschooler trying to learn the alphabet? Or maybe it’s your toddler? Either way, if you’ve got a child working on their ABC’s this is for you! I’ve got an active learner and getting him to engage in learning his letters is so difficult – until I started turning it into play time. When I let him use his screen time, which he dearly loves, to practice letters it turns from a fight into fun. 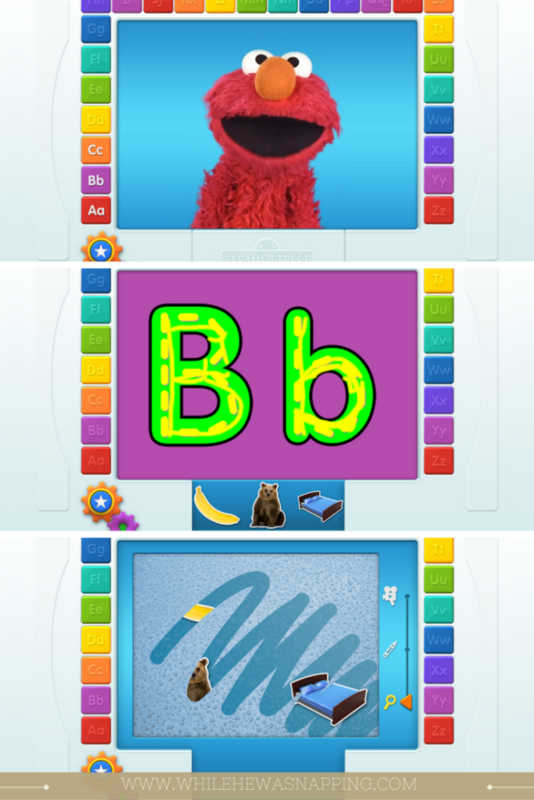 These ABC Apps have been so helpful in getting my little guy to learn and practice the alphabet. We live in a very technological world. And there are so many amazing things we can do with that technology, including teach our children. Screen time has come to have such a negative connotation lately that it can be difficult to utilize that tool without feeling guilty. Every time someone asks how many hours of screen time my kids get a day, I cringe a little on the inside. Not because I’m ashamed of my parenting, but because of that negative view towards screen time. Most people are concerned with “excessive” screen time, but my definition of excessive might not be the same as yours. And that’s okay! While I don’t relish being judged by others, I don’t feel guilty for the time my kids spend in front of a screen. Most of the time, my boys are playing educational games or reading books (or having books read to them). If screen time guilt is holding you back, evaluate how you use screen time and what benefits your family is seeing from it. When my oldest was 2, he could accurately identify a hexagon, a pentagon and an octagon. People would praise me for being so involved in his education at such a young age. Almost every time, their eyes would pop and their jaws would drop when I’d admit he actually learned it while playing on the tablet every night while I fixed dinner. It made dinner preparation easier for me to know my 2 year old was sitting at the kitchen table while I was cooking. And he was learning. 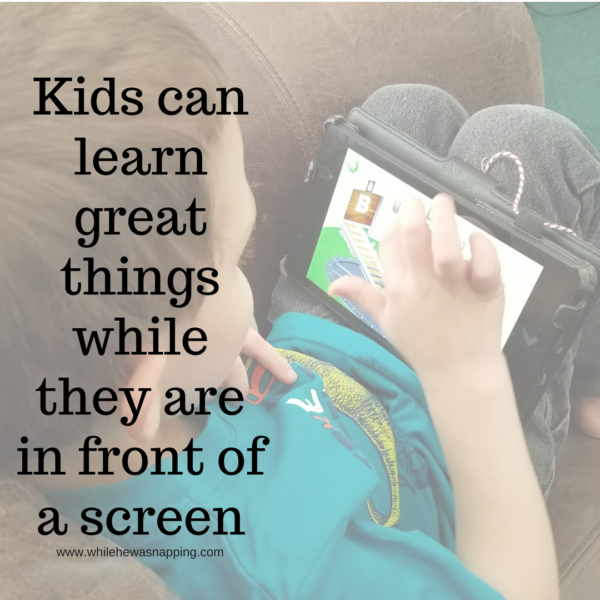 Kids can learn great things while they are in front of a screen. Teach something. Most of the time I’m pretty particular about what apps my kids play. I’m much more likely to allow screen time if the apps my kids want to play teach something like math, science, or reading. Not allow my kids to click off to other apps. My boys would download every app in every ad they ever see if I’d let them. Keep my child where he’s supposed to be and I will gladly hand over my money. No inappropriate ads. Even if the game is phenomenal, a sleazy or overly intrusive ad gets an automatic NO. Be aware that some of these apps DO have in-app purchases. Most are behind parent locks, but I recommend setting your account so purchases need to be verified with a pin or fingerprint and you’re not surprised with any unapproved additions to your app library. I truly have put in hours of time to ensure the quality of apps I let my kids play. Even educational ABC apps that seem harmless. The ABC apps below have been approved for our home and I encourage you to check them out before you let your little one loose. And, sometimes, things do change; so, if you notice something questionable in any of the apps I’ve suggested, please let me know! I don’t want to support and recommend garbage and I don’t want my kids exposed to it even more than I don’t want your children exposed to it. Some of the links included in this list are affiliate links. If you choose to purchase any (paid) apps through these links, I will receive a small portion of your payment. Your cost does not increase and purchases through my affiliate links help me keep this site running. These are ABC apps my family uses and I personally recommend. Here are the 10 irresistible ABC Apps I let my kids play, guilt and worry free! 1. 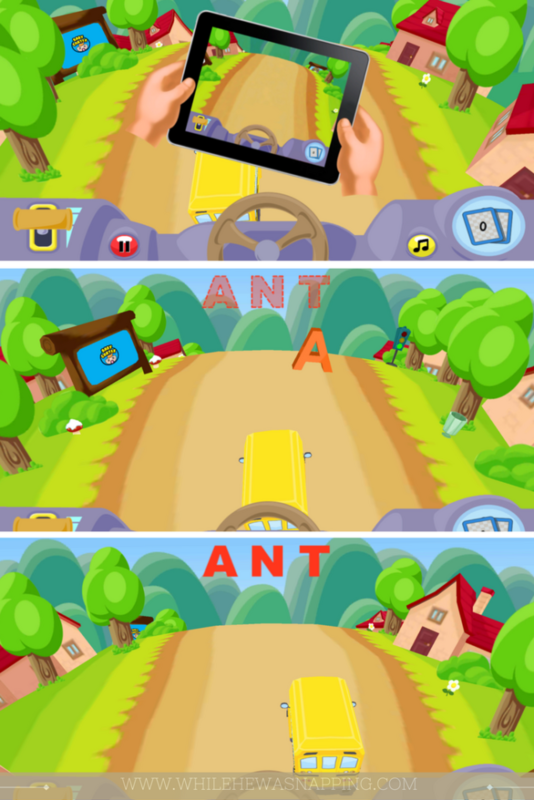 In Alphabet Car, you drive a bus (I know, I thought it was weird too) by tilting your device from side to side. The goal is to spell simple words by collecting each letter in the word by driving into it with the bus. The game gives a visual of the letter you are trying to collect (in the preschool level of the game) and says the letter name. Each level starts with just the next letter appearing on the screen. It gets progressively harder by adding other letters as your child progresses through the level. If your child knows the letter names, but not what they look like, this can help. There is a lite version that you can try out for free, but you can get the full version via an in-app purchase – which is behind a parent lock. 2. AlphaTots is awesome for letter practice. Each letter starts off with the upper and lower case letters being displayed on the screen and a voice says the name of the letter and it’s sound. Then there’s an activity to do. For example, “E is for erase. Can you erase the star?” After the star is erased, you can move on to the next letter, back to the previous letter. Or you can go back to the home screen and choose any letter. On occasion, Spinlight has sales. They are worth the full price though. 3. 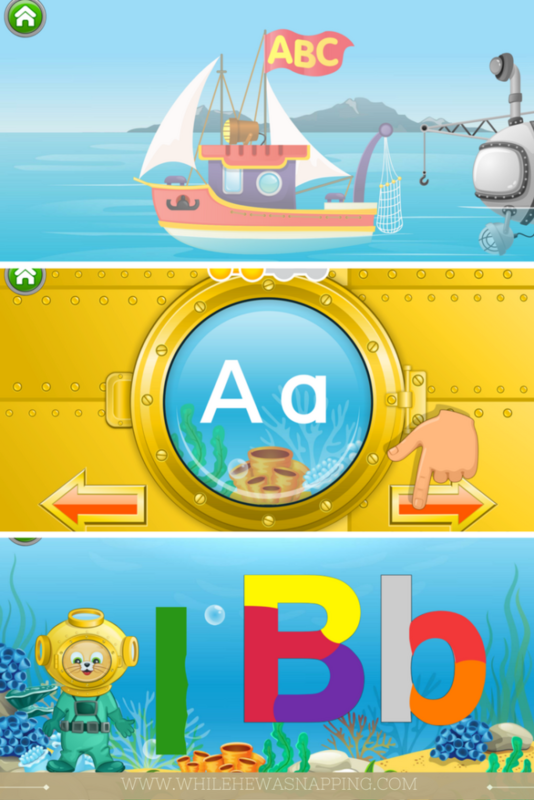 ABC Kids is a great ABC app that can grow with your child as they learn the alphabet. 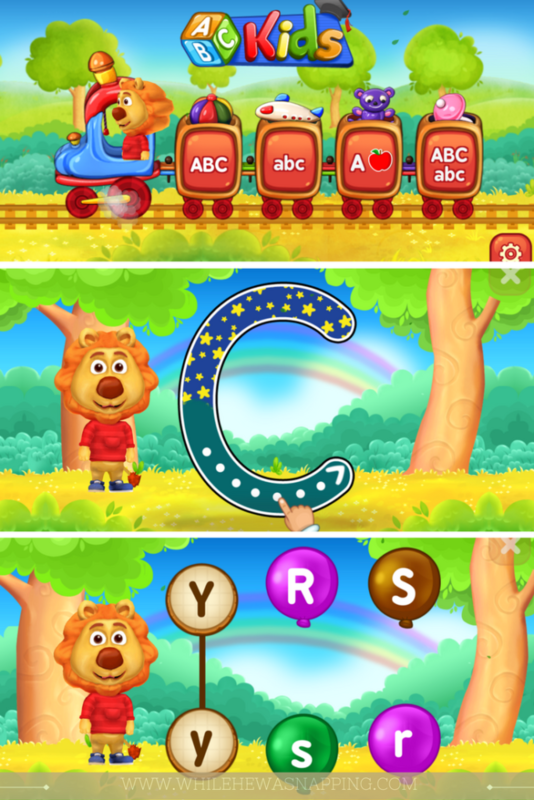 There are four games in this app: letter tracing for both upper and lower case letters, beginning sound matching and upper and lower case matching. The letter tracing games are great for introduction to the letter name and it’s shape. It teaches your child how to make the shape with guided tracing. The beginning sound match is a little more difficult. It’s ideal for those kids who know their letters, but aren’t reading quite yet. The upper and lower case matching is perfect for helping your child understand that each letter has two variations. This game is a full game, there are no ads and it’s FREE in the Play Store and the Amazon App Store. 4. This ABC app is a little less flashy than some of the other ones in this list. It is basic and effective, which is why I like it. In the lite version of the app, there’s only 2 games, but you can get all 15 games for about $3. The upside is that one of the two free games is the alphabet one, so you can try it out before you commit to the other games. 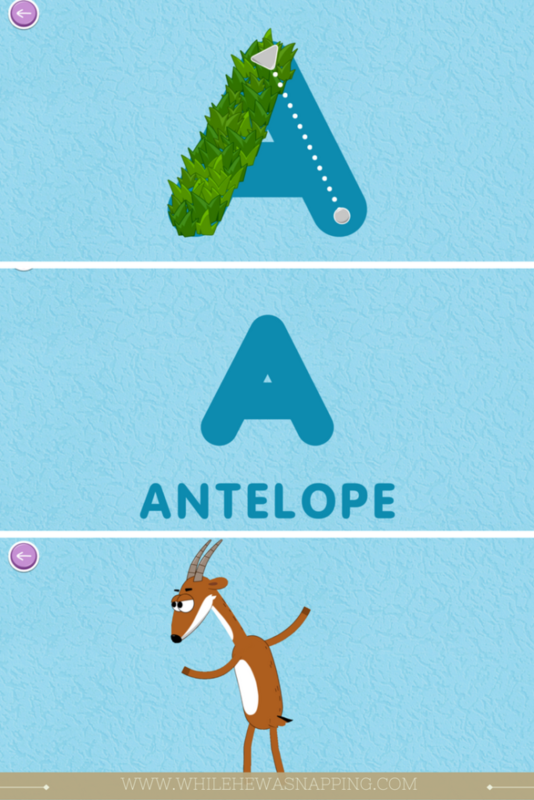 The free alphabet game focuses on matching letters and beginning sounds. 5. This is perfect for your Elmo-loving kid. It starts out as a letter tracing activity. I like this one because there’s a guide, but it isn’t overbearing. It gives your child room to explore and play with the form of the letters. After the letters are completed, there is an option to watch a short video clip, draw a picture or play a seek and find game with objects that start with the letter. The lite version of the app includes letters A-C, you can upgrade to get the rest of the alphabet. 6. This is a pretty basic tracing app, but it’s special too. When tracing the letters, different and unique textures and patterns appear in the trace lines. It’s engaging and will keep your kids guessing. I also really like that the words associated with each letter aren’t the typical alligator, bee, although admittedly letter C is cat, but most of them are different. Alive Alphabet Letter Tracing is Intellijoy’s latest app and is included in the subscription option. Heads up! Unfortunately, this one isn’t available in the App Store. If you use an iDevice, keep your eyes out for it and hopefully it will be added soon. It was released March 2017. It is in the Play Store and the Amazon App Store. 7. Kids ABC Trains Game is a must-have if you have a train-lover in your home. My boys have really enjoyed this game and it’s great. Five games are included in the full version of this app – it’s another Intellijoy app and also included in the subscription option. Letter tracing, letter recognition, letter sounds and upper and lower case matching games are all in this app. What my boys really love about this game are the frequent reward badges. The games are quick, which is great for my kids’ short attention spans. Heads up! Unfortunately, this one isn’t available in the App Store. But it is in the Play Store and the Amazon App Store. 8. This ABC app is great for beginners. It focuses on the basic fundamentals of letters such as letter names, letter formation, recognition of letters in both upper and lower case, matching upper and lower case letters, and alphabetical order. This is an Intellijoy app and included in the subscription option. It is a great place to start with your child and will help build a solid foundation and understanding of letters. 9. Kids ABC Phonics. 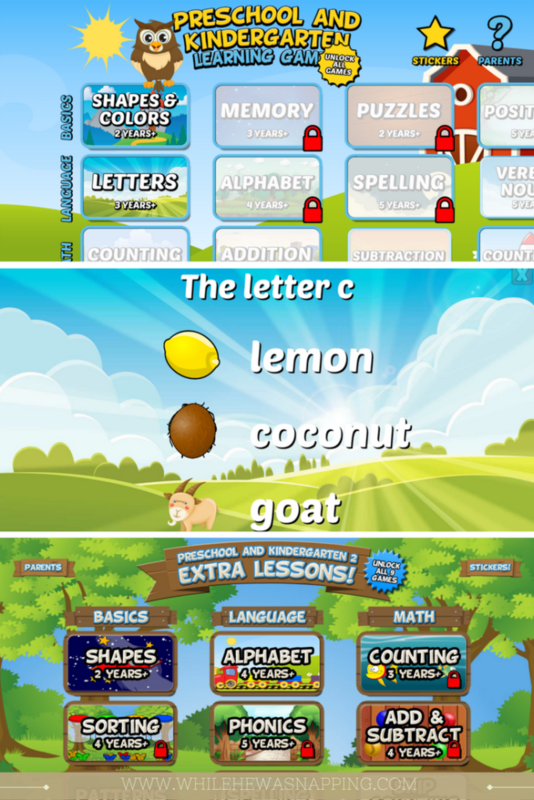 This game is also included in the Intellijoy subscription pack and builds on the previous app – Kids ABC Letters. The lite version has 4 of the 8 activities and no ads, so you can try before you buy. What I really like about this game is that it’s more than just letters and will grow with your child as they progress. 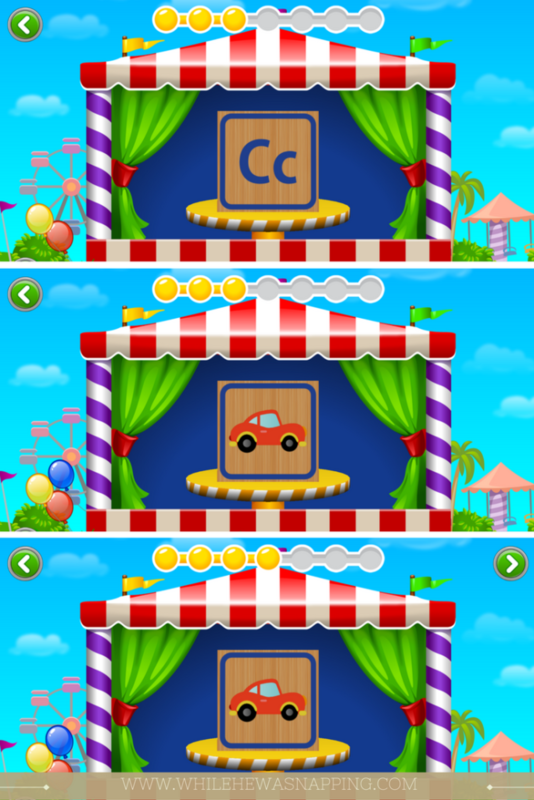 In this game, your child will choose a float to construct and take to the parade. This ABC app focuses on letter recognition and shape, letter sounds, basic letter blends, ending sounds and even introduces the concept of vowels. 10. Gappy Learns Writing is excellent if you have a little artist; they will love this game! It combines connect the dots with digital drawing. 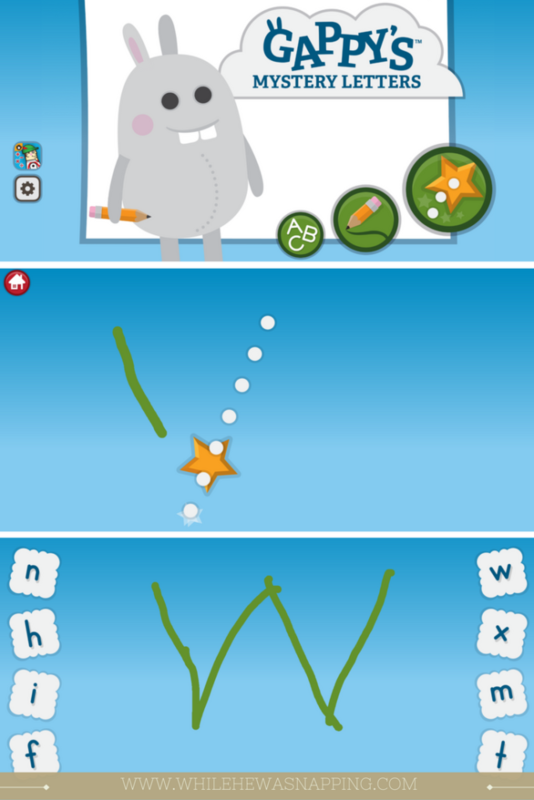 There is also a free draw mode where they can practice forming letters on their own. Before the letter is completely formed, your child can try to guess what letter they are creating. When all the dots are connected and the letter is revealed, your child will match the letter to the correct card on the side of the screen. Every time your child completes a letter, they’ll get a letter-themed coloring page. There are 52 pages to collect. There are also 3 letter styles to choose from. You’re amazing if you’ve made it to the bottom of this list! And as a special bonus I’ve got one more ABC app recommendation for you! Actually, this isn’t a specific app, but a type of app. We LOVE interactive storybooks, both my boys and I. If your kids love stories and reading, but you don’t have hours to spend reading to them, these are lifesavers. I highly recommend Oceanhouse Media apps. We particularly love the Little Critter books by Mercer Mayer and the Dr. Seuss books. You can buy the books individually or purchase collections or a subscription. If you think there’s any chance of purchasing several books, the collections are a great way to go because these books can add up fast. Books are one thing I have a hard time convincing myself we have enough of and I especially love how little space they require for storage. Digital books are definitely awesome for families that love to read. Each book has the option of reading to your child, reading guided by your child as they click on the words and letting your child (or you) read it. They also have some super fun interactive parts too, helping your active kids stay more engaged. In the Little Critter books, you can search for the spider on each page, just like in the original paper books. Don’t let guilt keep you from using these great resources to help your child learn. Not all screen time is equal. 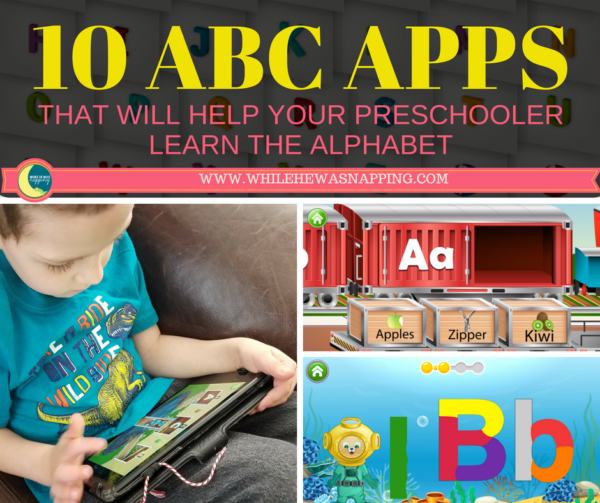 These ABC apps are good for your kids. And letting them practice letters with ABC apps that can guide them and help them while you make dinner, fold the laundry, or do your grocery shopping isn’t going to hurt. In fact, it just might help. DO YOU HAVE ANY FAVORITE EDUCATIONAL APPS FOR YOUR KIDS? Share your favorite apps in the comments. If your child is an ABC rockstar and is learning to read, click that next button to check out 5 awesome sight word apps that will help your child learn to read. These are wonderful apps for the kids and perfect learning tools. Not only can they enjoy the games but they can also learn from it as well. Great list of apps, Krista.